Evanston Mayor Steve Hagerty at a meeting. Hagerty and Northwestern President Morton Schapiro allocated $225,000 of the Good Neighbor Fund to job training programs in Evanston. A portion of the 2019 Good Neighbor Fund — Northwestern University’s commitment to donate $1 million to Evanston every year from 2015 to 2020 — will go toward strengthening existing and new job training programs in the city. 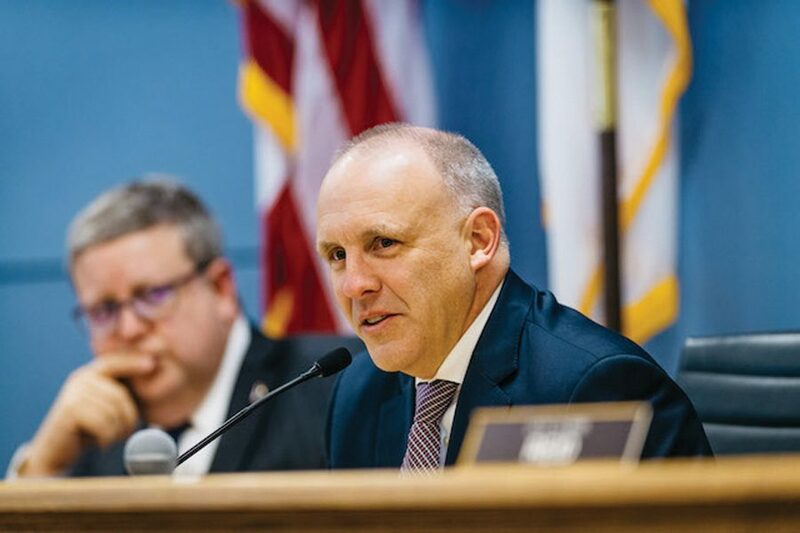 University President Morton Schapiro and Evanston Mayor Steve Hagerty decided to allocate $225,000 to two different Evanston organizations. The city’s Parks, Recreation and Community Services department received $135,000, and Elevate Evanston — the mayor’s workforce development initiative launched in 2018 to connect community members to potential employers — received $90,000. Elevate Evanston works in collaboration with many different nonprofits in the city. The initiative decided to give its funding to the city’s Youth Job Center, which provides job training to Evanston young adults. The donation will allow for a new full-time staff member at the Youth Job Center, Hagerty said. The staff member will be housed at Evanston Township High School and create a stronger connection between city employers and young adults. Hagerty said around 20 percent of students who graduate from ETHS do not go to college, and of those who begin attending college, an even larger percentage do not finish. Karen Tollenaar Demorest, the executive director of the Youth Job Center, said the “well-intended effort” to get young adults through college has left some on the sidelines. She said she envisions this new staff member to be a “bridge builder” between those young adults and employers in the community. The Youth Job Center is currently accepting applications for the staff position and plans to hold interviews later this month so that the new member can begin working as soon as possible, Tollenaar Demorest added. The Parks, Recreation and Community Services department will use the money from the Good Neighbor Fund for its existing career training programs, facilitated by the department’s outreach team, according to a news release from the city. The remaining $775,000 of the University’s annual donation supports the Evanston Fire Department’s paramedic services, funds a new after-school tutoring program and strengthens Evanston Public Library’s portable Wi-Fi Hotspot Program, as well as other initiatives. Schapiro and Hagerty have not yet discussed extending the fund past 2020, but when they meet to determine the allocation of money for next year, Hagerty said they will evaluate the successes of the fund and determine how to proceed. Patrick Deignan, the city’s interim community engagement manager, said he appreciates the University’s annual “commitment to the community” through this fund.